In today's "Shop Your Home" post we are going to talk about re-purposing a conventional piece of furniture in an unconventional way. A little while back I did this diy Ikea bar cart hack and turned my plain bar cart into a more pretty, fun piece. However since then I managed to score the Target bar cart that I had been wanting all along right before they packed up and left Canada. Long story short I ended up having two car carts in my possession. When we moved into our home I wasn't sure what I wanted to do with the Ikea one as we have an open concept main level. I didn't want two bar carts in that space (nothing screams I love wine more then having a bar cart in every room haha). So I ended up putting it in our main floor powder room. 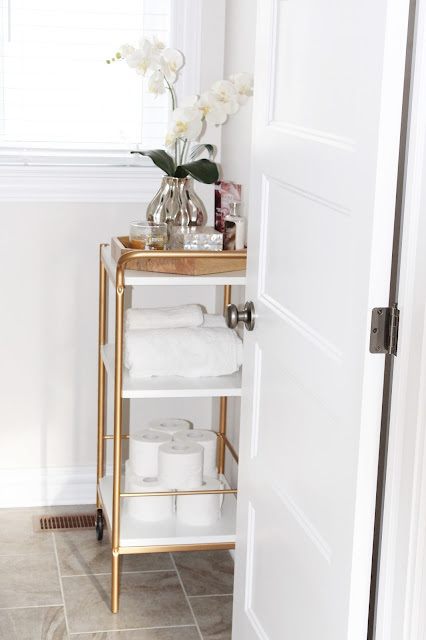 Now this might sound strange, a bar cart in the bathroom but it has actually been amazing for storing bathroom necessities. We have a pedestal sink in the powder room so there isn't any vanity storage so having a three tier cart in there has been really functional and looks great. 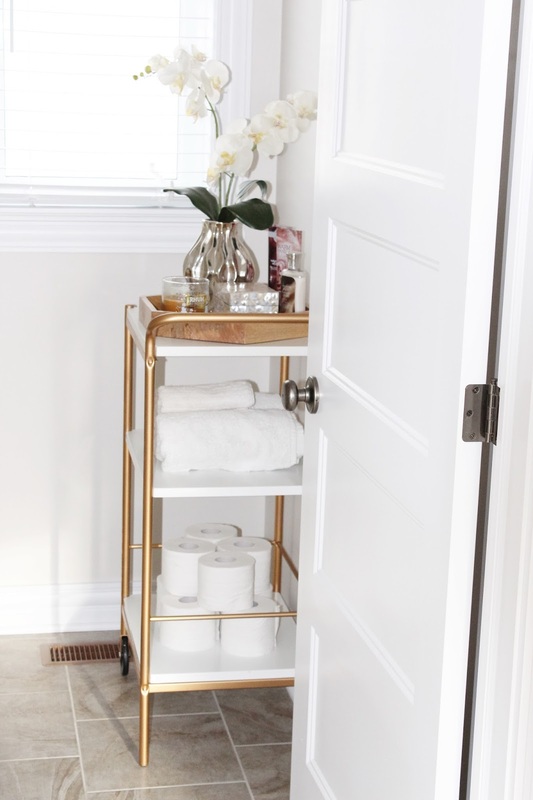 I have had so many compliments from friends and family about it because it's not your typical bathroom storage unit. Rather then having to go out and purchase another piece of furniture, I was able to use the bar cart in a new way and I'm really happy with it! I hope this will help some of you guys think of pieces you already have and how you could re-purpose it to work in a new way. Just because something is meant for one type of space, doesn't mean it won't work beautifully in another.